Prominent & Leading Wholesale Trader from New Delhi, we offer autofy petrol tank stickers for bikes, autofy bike helmet mohawk sticker and autofy bike usb mobile charger. 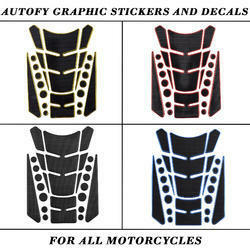 Autofy US adhesive stickers are available for beautifying all Bikes / Motorcycles and Scooters. This waterproof glossy sticker gives a charm to your bike. It is UV-Resistant topcoat sticker with US adhesive which has a very long sticky life. The texture with stylish coloured side cutting gives your bike a sports look. For all the pro bikers with Harley Davidson, Bullet, Royal Enfield, Thunderbird, Avenger, Pulsar, Duke KTM, Harley Davidson, Yamaha FZ, R15, CBR, Ninja, Apache, Hayabusa and others this is a must have to make you a trend setter and stand out of the league. Everyone loves to personalize the things they own. A helmet is something that either cannot be customized much and even if any hardware customization is done, it comes at the price of compromises in safety features of the helmet. Autofy Universal Rubber Helmet Mohawk Peel and Stick Spikes is a customization you can easily add without adding load to your pocket or causing any changes in the safety features of your helmet. Made of high-quality rubber, this Mohawk can withstand high temperatures of summer afternoons without losing its color or quality. Water too, cannot cut short its life so you do not have to fear going out of style in the rainy season. The adhesive used is of the highest quality that does not come out easily as it has been tested against high-speed winds. Neither does is pose any harm to helmet’s paint if you intend to remove it. 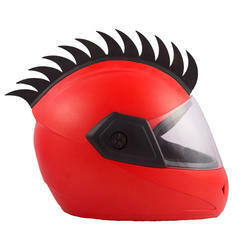 This Mohawk is of universal fitting as the soft rubber can also be cut to suit the size of the helmet it is placed upon. In case you want your helmet to reflect your style and make you stand out in the crowd, get your hands on this awesome product from Autofy. Can be pasted on all types of helmets by Habsolite, Studs, Steel bird, Vega, O2, Power, Wrangler, Moto trance, etc. Highly recommended for bike riders bike enthusiasts, bike lovers and biker boys who love their bikes Royal Enfield Bullet Standard 350, Royal Enfield Bullet Standard 500, Royal Enfield Bullet Classic 350, Royal Enfield Bullet Classic 500, Royal Enfield Bullet Classic Desert Storm, Royal Enfield Bullet Electra, Royal Enfield Bullet Thunderbird 350, Royal Enfield Bullet Thunderbird 500, Avenger, Pulsar, Duke KTM, Harley Davidson, Yamaha FZ, R15, CBR, Ninja, Apache, Hayabusa and other bikes. Autofy black bike USB waterproof mobile charger is the best quality product which comes to you at a very reasonable price. This bike USB port comes with an LED to notify its working. This USB generator is universal for all mobile device models like iPhone, iPod, Samsung, Mi, Xiaomi, Motorola, HTC, Windows, Micromax, Nexus, LG, Nokia etc. This bike USB charger comes with a protection cap making it waterproof and dust proof. It provides you with a quick charging feature where your bike’s battery charges your mobile phone quickly. It is a very handy product when you commute daily and are worried about your mobile’s charging or going on long trips by your loved motorcycles like Harley Davidson, Bullet, Royal Enfield, Thunderbird, Avenger, Pulsar, Duke KTM, Harley Davidson, Yamaha FZ, R15, CBR, Ninja, Apache, Hayabusa and many more. This motorcycle USB charger / port is need of the hour for today’s bikers.